Children at Dartmouth Pre-School are having fun with new educational equipment funded by a generous grant from Dartmouth United Charities. The preschool is a not for profit organisation who aim to keep their fees low to enable all families to access early years education regardless of whether they qualify for funding. In what appears to be an affluent town, there are significant pockets of deprivation and poverty affecting children’s home life. Pam Reeves, Manager of the Pre-school said ‘Much of the specialist equipment has been specifically chosen to support children with emerging learning difficulties and special educational needs to help their development progress. We have a wonderful new playroom and balcony area, but many of our resources are getting tired and we wanted to ensure we have relevant, modern resources for all our children. The Friends of St John’s Parent and Teacher Association obtained a grant from Dartmouth United Charities to pay for music therapy sessions. A member of the Friends group heard about the DUC grant scheme through an article in the Chronicle and took the opportunity to apply for a grant for the pupils to access music and learn in an environment which is fun and therapeutic. 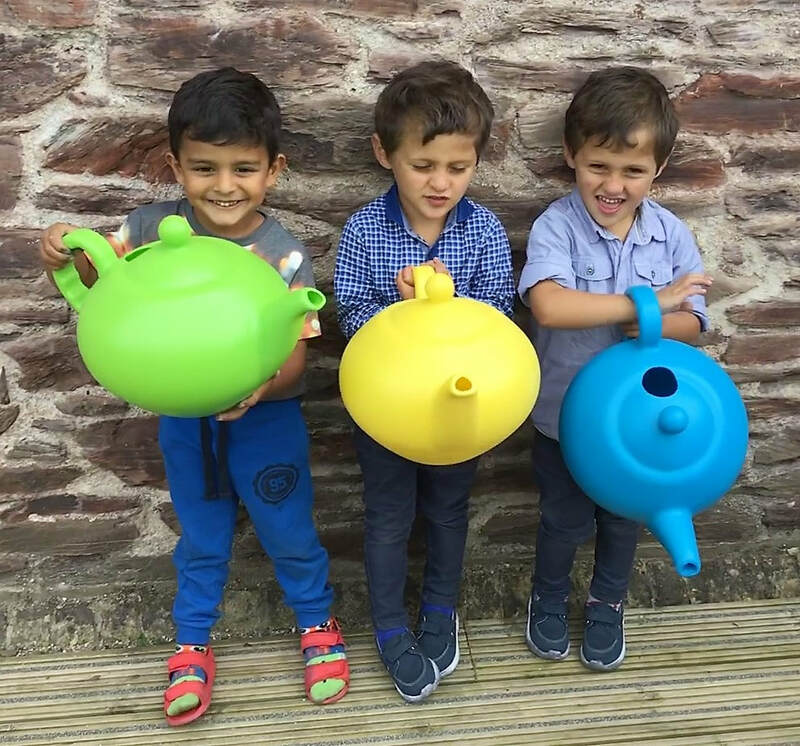 Music therapist, Becca Wintle from South Devon Music Therapy said: “We do a variety of musical games and activities encouraging self-expression, discussion about feelings, encouraging empathy, listening to others and taking turns. “We also have a relaxation at the end of the session, encouraging the children to practice mindfulness, being aware of their breathing as they listen to a relaxing song. “I have already seen improvements in the students’ ability to listen to each other, for example playing quietly or loudly in response to another student’s music. “All the students seem to respond well to the relaxation, enjoying the opportunity to lie down and listen to calming music. Dartmouth United Charties give Dart Sailability a lift! George Hardy (left) and Jill Cawley see the Dart Sailability hoist in operation. ​Dartmouth United Charities have given a generous grant to Dart Sailability to purchase and install a new hoist. 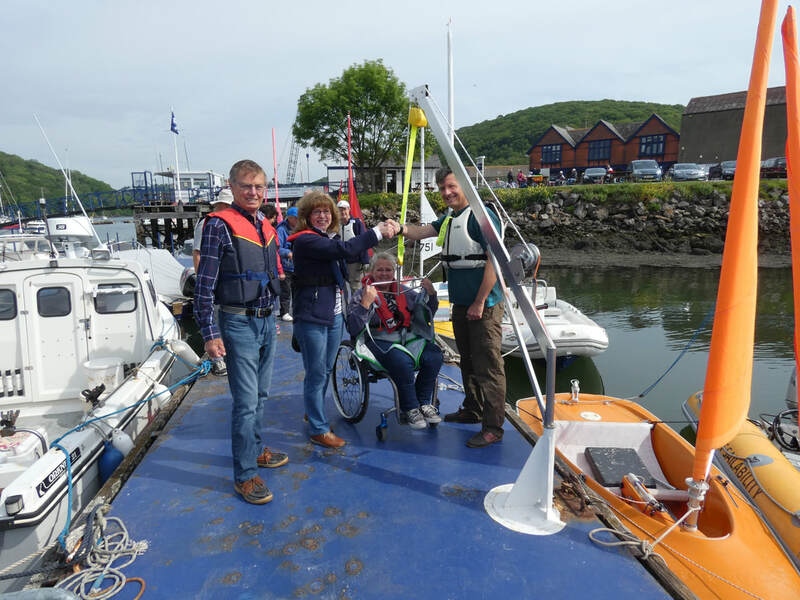 The hoist, mounted on the pontoons at Premier Noss on Dart Marina on the River Dart, is essential to enable the safe transfer of disabled sailors between their wheel chairs and Sailability’s specially adapted sailing dinghies and power boats. The new hoist provides more flexibility and is easier to operate than the hoist it replaces and conforms to the latest standards. Jill Cawley, Chairman of Dartmouth United Charities and George Hardy, a trustee of the charity, visited Noss Marina on Tuesday. They were greeted and warmly thanked for their generous donation by Steve Watkin, Deputy Principal of Dart Sailability. They met the Sailability volunteers and sailors and saw the new hoist in action, then ventured on to the river in a support boat to get a close up view of the sailors themselves in action. The funding will help Youth Genesis to deliver two weekly youth clubs and a street based youth project which aims to support young people hanging out on the streets of Townstal on Friday nights. The organisation works with communities to develop quality youth activities and projects for young people aged 11-25. The youth clubs include: Decks Youth Venue, which is open on Thursday evenings from 6.30-8.30pm at the Ivy Lane Young Peoples Centre and The Point Youth Drop-In, which is based at St Clements Church Hall in Townstal on Friday nights from 7.00-9.00pm. Both sessions are aimed at 11-17 year olds, with youth volunteering opportunities for 18-25 year olds. The youth sessions offer games, crafts, cooking, discussion groups, bicycle repair, sports activities and support for young people experiencing challenges such as bullying or social isolation. The youth sessions are staffed by a team of volunteers who give their time to support over 140 young people each week. Funding for the youth sessions comes from a mixed range of sources, which includes Dartmouth Town Council, local Churches and more recently, Dartmouth United Charities. Youth Genesis is also working in other parts of Devon to support communities to setup youth projects and activities for 11-25 year olds in areas where there are currently no generic youth services. The Youth Genesis approach is to work with communities to identify assets and explore how they can be best used for the benefit of local young people. Building on the work in Dartmouth, Youth Genesis is about to relaunch the Youth Leisure Nights on Friday, May 11, which will be based at the Dartmouth Leisure Centre. ​Dartmouth United Charities has given out a massive £65,000 of grants over the past 12 months to local organisations and individuals in Dartmouth - and has more to give! Organisations who have recently benefited include Dartmouth Caring, Citizens Advice South Hams, Dartmouth and District Foodbank, Dartmouth Children’s Centre, Dartmouth Indoor Pool and Devon Air Ambulance. The grants have gone towards services that help support local people who are vulnerable or in financial need as well as funding specialist equipment and facilities to enable access for all. Grant funding has also contributed towards improved facilities for all Dartmouth residents. Devon Air Ambulance pilots can now remote control the floodlights for landing at the football ground at any time of the night; and Dartmouth Indoor Pool has been able to install a poolside lift to assist people with disabilities. Dartmouth United Charities welcomes grant applications from organisations delivering services in Dartmouth to residents in need and from individuals who have been resident for a minimum of 2 years. Application forms and grant guidance can be found on the grants page.